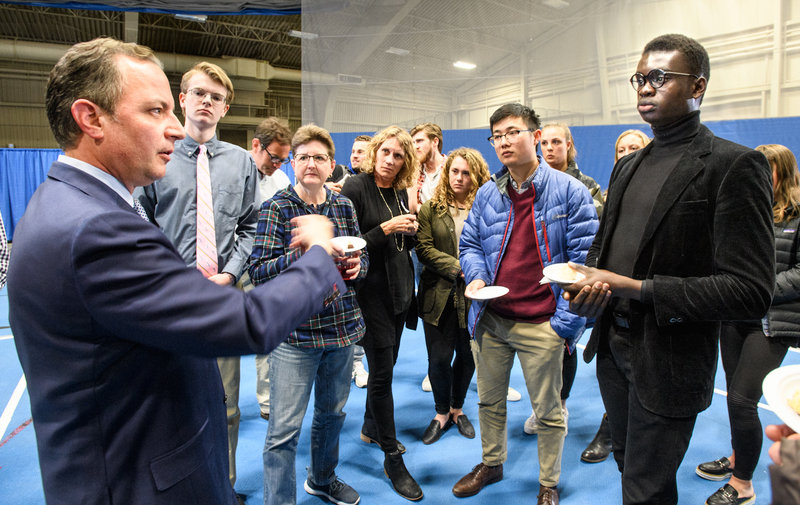 Reince Priebus, former Trump White House Chief of Staff and journalist Jackie Judd P'14 chat with President David Wippman. 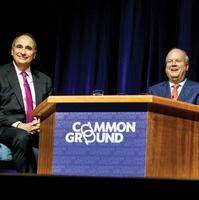 A lighthearted moment at the Common Ground event. 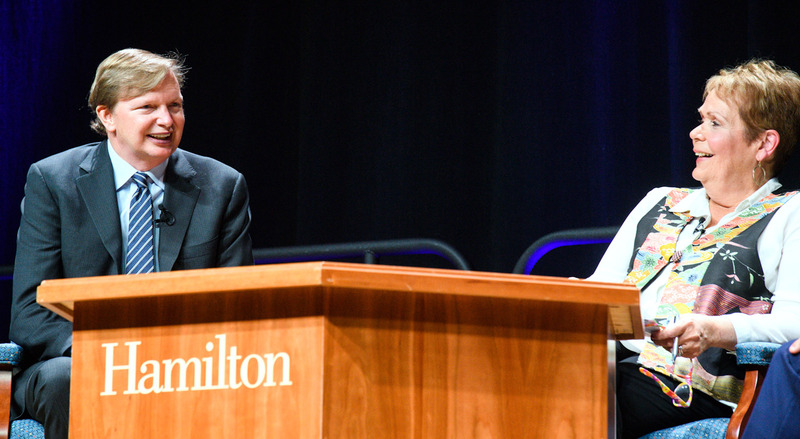 Jim Messina answers a question from moderator Jackie Judd P'14 during the Common Ground event. Jim Messina, left, and Reince Priebus shake hands following their Common Ground discussion. 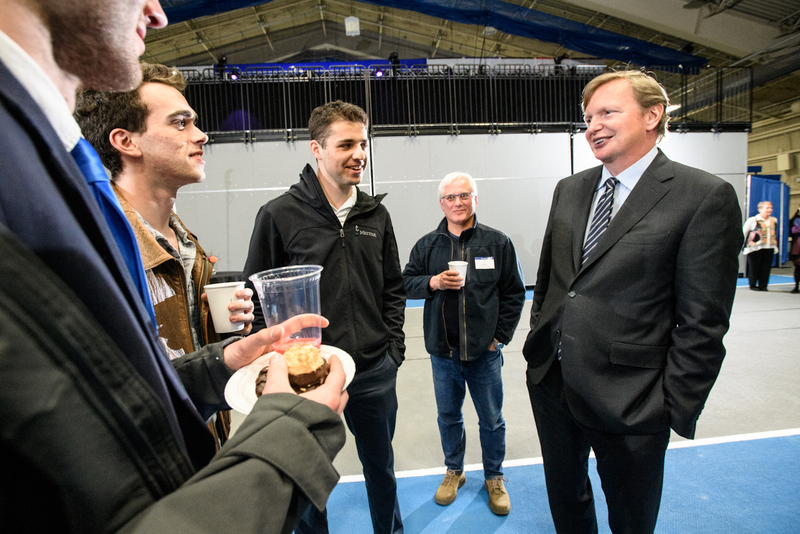 Jim Messina, former White House Deputy Chief of Staff and President Barack Obama’s 2012 campaign manager, chats with students during a reception. Reince Priebus speaks with students following the Common Ground event. 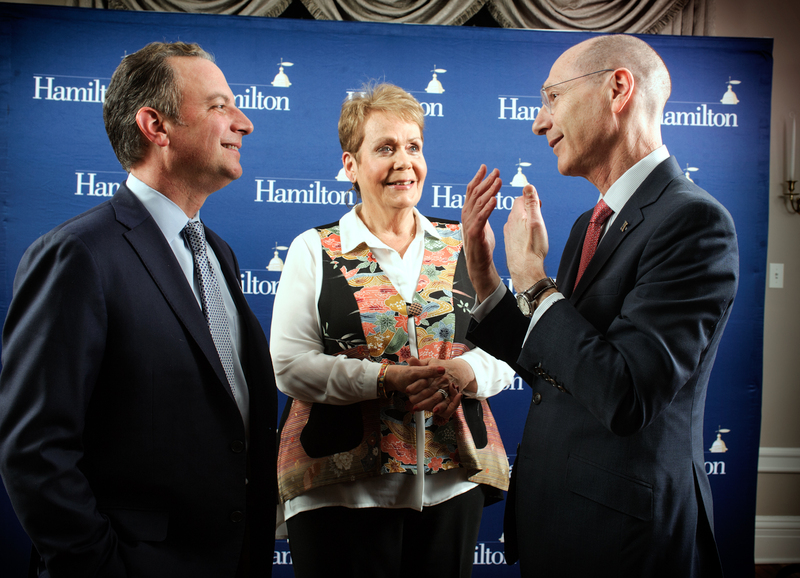 Hamilton community members were transported across party lines on April 11 as Jim Messina, former Deputy Chief of Staff to President Barack Obama, and Reince Priebus, former Chief of Staff to President Donald Trump, engaged in a Common Ground dialogue surrounding some of the country’s most pressing issues. 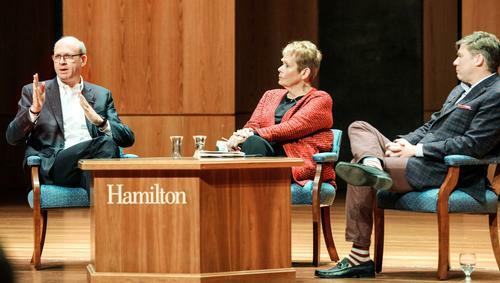 The event was moderated by Jackie Judd P’14, a veteran journalist and political communications consultant. 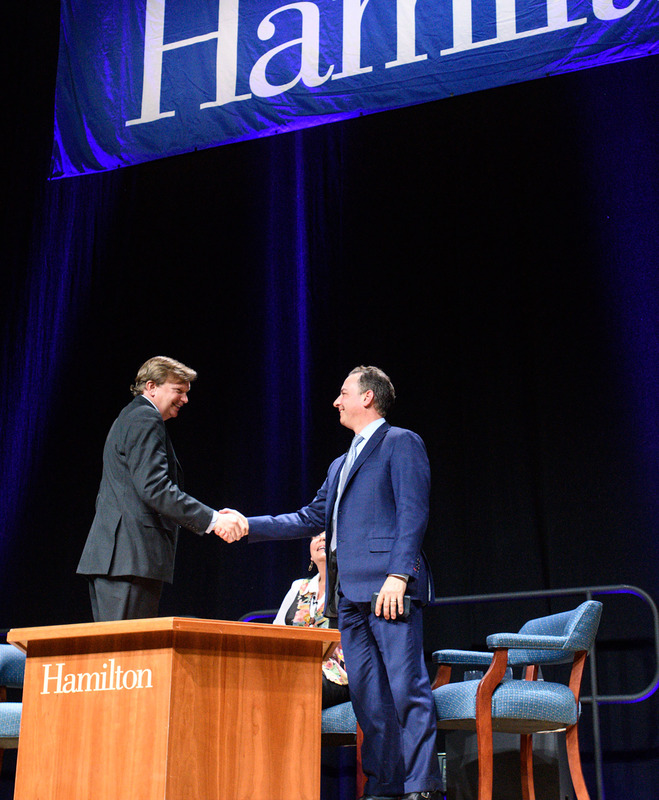 The first topic addressed by Messina and Priebus was the extreme polarization of American politics. “The data says that America’s now the most polarized country in the world,” Messina said. While both former staffers agreed this was an urgent problem facing our nation, they attributed it to different factors. 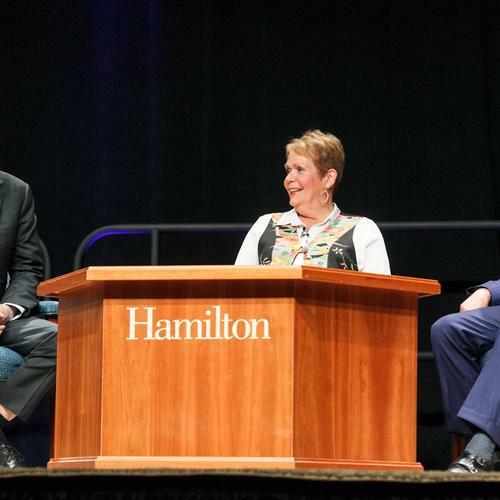 The two speakers then addressed an array of topics, including their experiences as White House staffers, immigration policy, environmental policy, gun safety laws, the national debt, and the outlook of the 2020 presidential election. 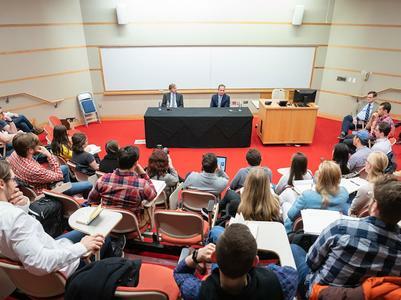 The conversation sometimes seemed pessimistic about the future of the U.S., especially when Messina and Priebus discussed what matters to voters. However, a recurring positive dialogue throughout the night was the heightened engagement of voters in 2018 and the likely continuation of this trend. On the brink of possible U.S. airstrikes in Syria, and a summit meeting with North Korea, the discussion between Susan Rice, former U.S. ambassador to the UN and national security advisor to President Obama, and Condoleezza Rice, former Secretary of State and national security advisor to President George W. Bush was particularly relevant on April 11. 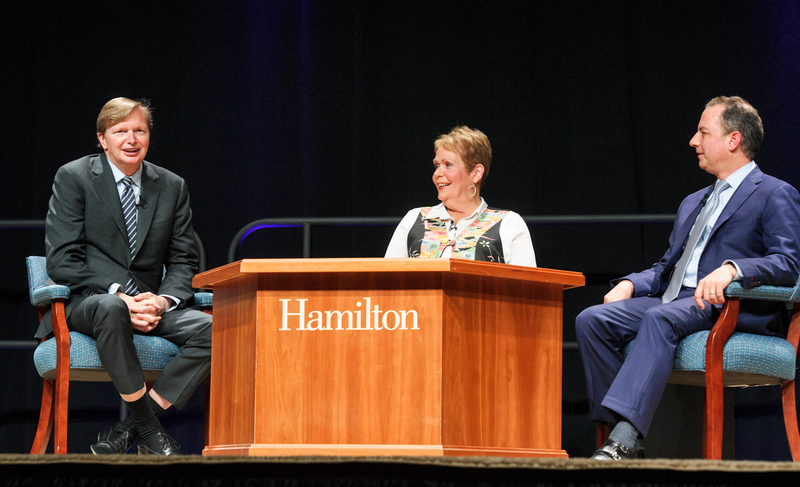 The Hamilton community crossed and recrossed the aisle on October 18 during the inaugural Common Ground discussion, which featured David Axelrod and Carl Rove, chief strategists and chiefs of staff for former presidents Obama and Bush 43rd, respectively, as well as moderator Susan Page, Washington bureau chief of USA Today.